Recently I have been looking into buying a fifth wheel but did not know where to find the best bang for my buck. 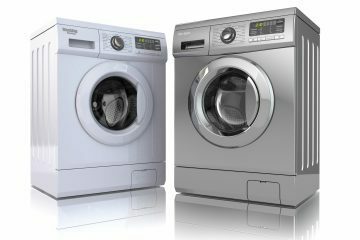 There are so many options, but here is a list of companies I found that make awesome fifth wheels. 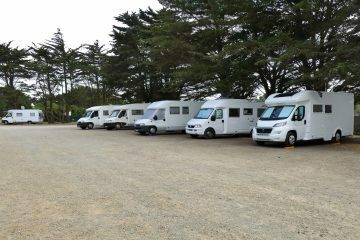 Purchasers have found that these manufacturers make trustworthy and reliable campers. 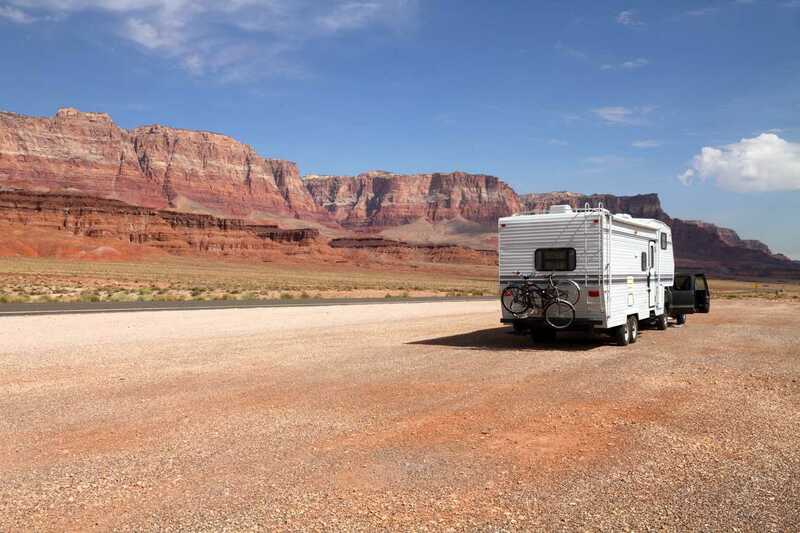 I took a closer look and found four awesome companies that have incredible reviews when it comes to their fifth wheels. If you want to know more about any of these leading fifth wheel companies, keep reading as I give my insights into all of them. 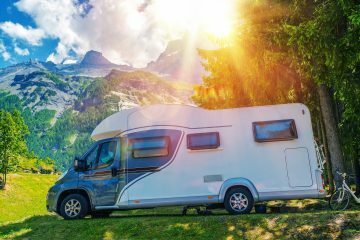 Redwood is an RV company that has been around for only about 8 years and is already ranking in highly in the satisfaction rates of customers. This company is Indiana-based, but people from all over the nation are loving it. Eighteen different floor plans are offered. That’s a lot of floor plans. Because there are so many options, you have the chance to pick a floor plan that best meets your needs and your wants. This offers a lot of happy mediums for couples who are purchasing a fifth wheel but have different wants for this new toy. There are 4 to 6 sleeping capacities in each fifth wheel depending on how many you need. This offers a lot of room and versatility you may not have found elsewhere. Overall, they have a 36 to 41 feet footprint. This is a massive amount of space to have fun in. There’s no stepping on one another’s personal time and no feeling the classic cramped feeling that is associated with fifth wheels. Redwood fifth wheels have a 36 to 41 feet footprint. Another desirable quality is the two 15,000 BTU air conditioners. These are placed in such a way that the whole fifth wheel will stay evenly cooled. It makes summer trips much more enjoyable for everyone. Also, included is 35,000 BTU furnaces to keep everyone warm during winter trips. Oftentimes, privacy seems to be missing in fifth wheels. However, with Redwood, the outside world stays out with dual-pane windows and a private bedroom with blinds and curtain toppers. This private bedroom also comes with HGTV for when you need a touch of home. Just like you do at home, you will want to be cooking on the road. Redwood’s fifth wheels have solid surface countertops with tons of space for you to prepare all types of food to bring your family together. These are placed just below the solid maple hardwood cabinets. While you are cooking, you may want to have a little extra fun and play some music. Their fifth wheels come fully equipped with sound bars so you can play your tunes! The last thing that really stuck out to me with Redwood fifth wheels was their safety. You can feel safe with the oversized electrical brakes their fifth wheels are equipped with. The DRV Luxury Suites are large. As long as you have something strong enough to tow it, this is a wonderful and truly luxurious option for those who enjoy camping. These fifth wheels are built for war. They are sturdy and oversized. DRV Luxury Suites are 34-44 feet in length and are considered some of the most spacious options in the fifth wheel community. You can feel safe in this specific fifth wheel. Although it’s not likely to happen, this fifth wheel can take quite a few punches and come out on the other end just fine. They weigh in at 13,8000 – 19,8000 pounds! DRV Luxury Suites weigh in at 13,8000 – 19,8000 pounds. You will feel as if you are in an open space with the 8-inch interior ceiling height, giving the fifth wheel an open floorplan feel on the road. DVR Luxury Suites really are upscale. They are built to impress. They come with custom hardwood dinette, hand-laid vinyl laid tiles, hard polished surface countertops, and hazelnut/ mocha cherry cabinets. You may even decide you want to host a party for your campground when you hear about the LED lighting. 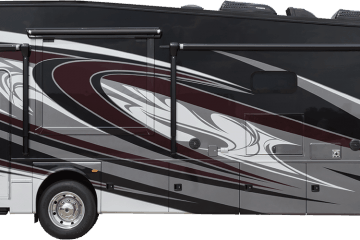 You will feel the style while staying in this unique experience of a fifth wheel. Each of the 20 different floor plans comes with four season perimeter heat ducting in the floors, which is a huge plus during the cold months. One other exciting and lovable feature is the frameless tinted window glass to keep your privacy while also looking incredible. Coachmen Chaparral is all about helping you have more sleep space. Oftentimes while traveling in a fifth wheel, we do not have the best sleep options. Coachmen Chaparral wanted to correct this. You can fit 11 fully grown people in their spacious sleeping accommodations, thanks to their bunkhouse floor plan. Luckily the floor plans generally reach or exceed 40 feet so there will be no feeling cramped even with 11 adults around. And there is no need to worry about being uncomfortable because everyone keeps changing the temperature. Coachmen Chaparral has a dual zone thermostat controllers so everyone stays happy. You also do not need to be worried about the weather wearing on the outside of your beautiful new fifth wheel. It is painted with UV and weather resistant decals to ensure that year-round, weather regardless, your fifth wheel stays in pristine condition. Also included is dual USB charging ports, a panoramic sofa, 50/55″ TV, wide electric fireplace, and dual pane windows! 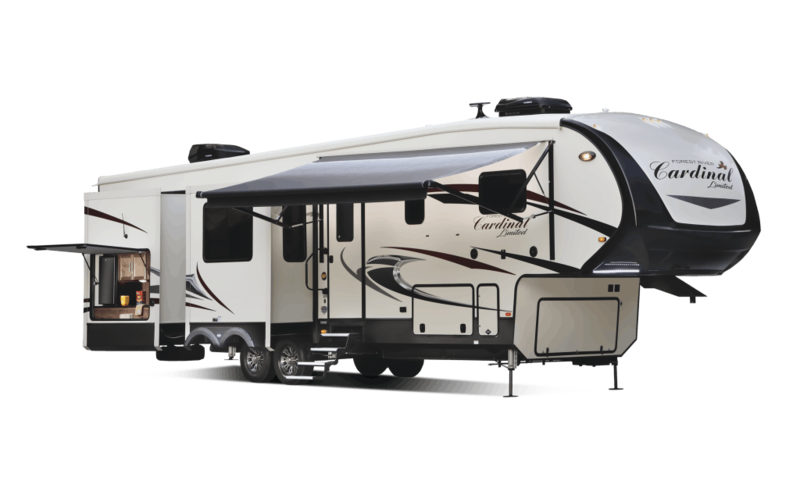 Cardinal has 7 exciting fifth wheel floor plans! For a closer experience, these fifth wheels can hold up to six people in their 34 -41 feet plans. They are also extremely safe and come with an LP leak detector. To relax, sit down on one of the three leather rear sofas or pull out their hide-a-beds. Maybe you want something a little more, and in that case, you should head to the back and take a nap on the king-sized bed with a premium innerspring mattress. You will wake well-rested. Not only is the Forest River fifth wheel safe, but it is also very comfortable. It is beautiful to be in and has a 15,000 BTU-ducted, domestic, quite cool AC system. It’s also beautiful to look at with its solid hardwood slide out fascia frame! On the outside is a full outside shower, so you can keep clean and not make a mess inside your beautiful new fifth wheel. This is connected to your fifth wheel with a sliding glass door entrance on one side so you can sneak out, clean up and sneak back in all in a very private manner. 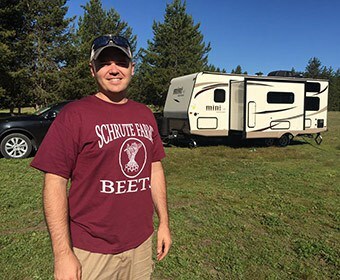 Which fifth wheel manufacturer is the most family-friendly? 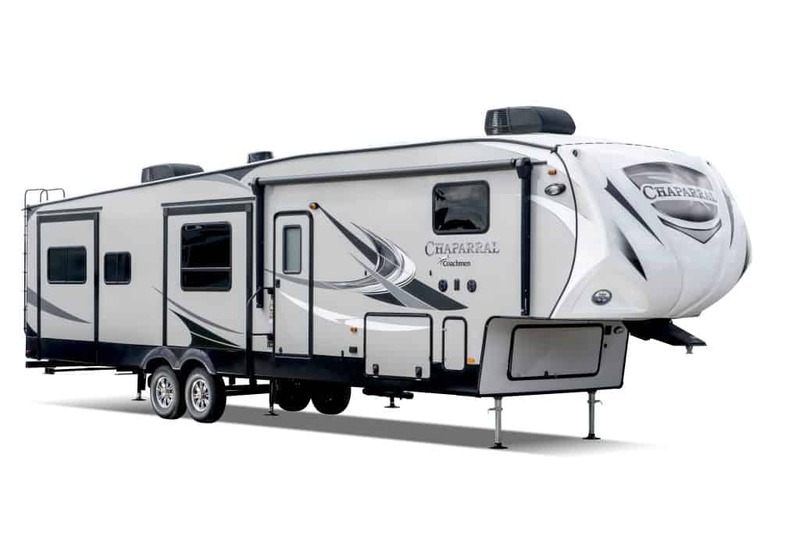 The Coachmen Chaparral Fifth Wheels seems to be the most family-friendly. Family trips usually have a high number of attendees, and what is one thing we always run out of on family trips? Room. This is unlikely to happen in a spacious Coachmen Chaparral fifth wheel. Which fifth wheel would be the best to take out in all seasons? Coachmen Chaparral also takes the win for this as well. Between its heating, cooling, and its UV and weather resistant decal and paint, those inside the fifth wheel (and the fifth wheel itself) will be in their best condition year-round. 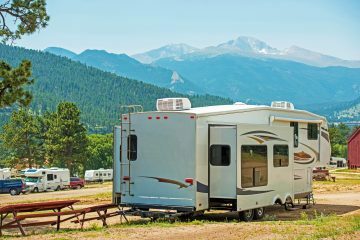 Can I make payments on my fifth wheel? More often than not, the dealers you purchase your fifth wheel from will be willing to take month-to-month payments for your fifth wheel. Think of purchasing a fifth wheel as you would purchasing a vehicle. Loans are often available for those who qualify.